2017 is slowly ticking down into its final months and I've been seeing mince pies in the supermarkets already! Groan! Thankfully, we have loads to look forward to in October before Christmas rears its snow-covered head, including pumpkin spiced lattes, crisp autumnal mornings, and (of course) Halloween! I also have lots of exciting content lined up for you this month, including a delectable vegan recipe, a post all about confidence, and an OOTD as well! It's also my pleasure to introduce this month's crop of new advertisers, who cover everything from mental health to gaming to history on their blogs, a real diverse mix! Let's get started! Drumroll please for my first October advertiser: the lovely Laura from Petals and Chains! Laura has recently relaunched her blog, and enlisted me to give her a hand! Petals and Chains was born, and the beautiful name has a bigger story behind it than you might initally realise! The name symbolises precisely what Laura's blog is all about: the petals represent the lovely aspects of lifestyle blogging that Laura will be sharing, and the chains stand for the mental health stigma that she intends to break through her blog! I have always found Laura's writing thoroughly impactful and thought provoking, whether it's threads about her political standpoint on Twitter, or her posts about her continuing therapy sessions, you will certainly find something in Laura's content to interest you! I'm proud to be sharing Laura's blog with you this month, she's a great friend to me and I love her to bits! Next, I'm happy to introduce Nele (pronounced Nayla) as my second star advertiser! Nele has one of the most stylish and aestheitcally appealing blogs out there - the pastel, minimalist photography and intriguing, diverse posts complement each other beautifully. As well as travel, lifestyle, beauty, and fashion, Nele also covers gaming on her blog, featuring everything from Pokemon Go to Animal Crossing! I absolutely love that Nele shares all of her many interests on her blog, remaining true to herself in every post. My favourite content on her blog is definitely her travel features, her posts on Rome and Mallorca never fail to give me wanderlust! On social media, Nele is a total sweetheart and pleasure to interact with, so make sure you pop her a follow over on Twitter. Turning now to my Bee Advertisers, please welcome the gorgeous Mel! Mel blogs about lifestyle, mental health, wedding planning, and so much more! Mel's ethos is that more open and honest conversations need to be had about mental health, breaking down barriers and ending stigma. For this reason, she is always open and honest about her own experiences with OCD and emetophobia on her blog, and these posts are incredibly powerful! Mel's blog really shows anyone who struggles with their mental health that they're not alone, so her blog truly deserves a round of applause! Go follow her now! I was truly delighted when my wonderful friend Kate booked an ad package with me this month! I wax lyrical about Kate's content all the time, so to get the chance to do so even more than usual is just fab! Kate uses her blog to document her travels across the UK, as well as Indonesia and Europe. Each post is accompanied by stunning photography and her chatty, friendly writing style. Kate also regularly showcases her outfits and she never fails to look stunning in every post, she deserves to have way more confidence in her abilities! Please pop over and visit her blog - you won't regret it! Summing up my third Bee Advertiser's blog is a pretty tricky task, but I am going to attempt to do Envy's wonderful site justice! Envy writes about all things random and crative over at Lost In Translation, posting about her travels, sharing her art and creative writing, as well as all things geeky! Envy shares everything she's passionate about and writes with personality and pizzazz! I especially love her travel posts where she sums up her trips in a series of short thoughts - it's a really unique and effective way of documenting her journeys and bringing them to life! Her blog is a must-read for any fellow creatives! It's a welcome back for my pal Tarnya as a Rose Advertiser this month! As well as sharing posts on her lifestyle blog, Taryna is at the helm of her very own Etsy shop! She seems to have an endless supply of creativity, painting gorgeous watercolours of every Disney character you could wish for! Taryna's blog is slick and professional, covering a whole range of topics, but it never loses its friendly, endearing charm. Definitely check out her content if you're looking for a new read this month! My final Rose Advertiser for October is the fabulous Llinos! It is always a pleasure to showcase this wonderful lady's content: She is always the first to offer kind messages of support on social media, as well as sharing some fantastic posts of her own, covering books, creative projects, and history! Llinos's historical content is always my favourite, especially as she loves Tudor England just as much as I do! You'll be missing out bigtime if you don't follow Llinos! 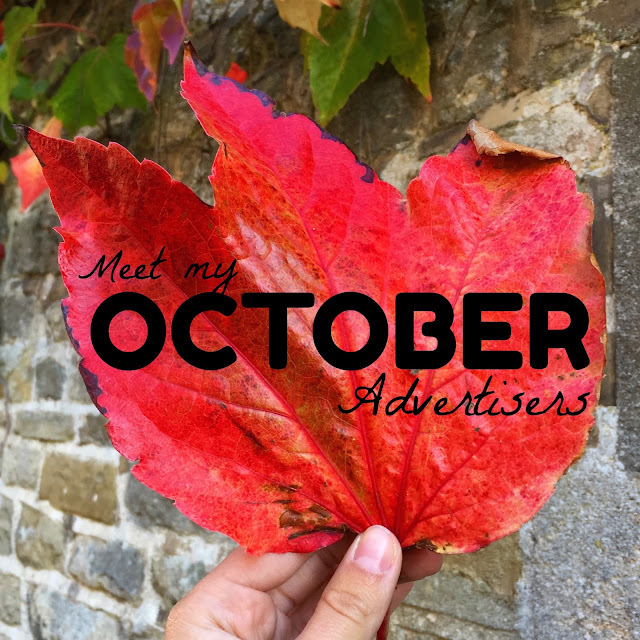 And there we have it - my fabulous group of October advertisers! If you're interested in booking an ad package with me, November is completely sold out, but I have a couple of spots left in December, so get in touch quick! Prices start at just £1. What is coming up on your blog this October? Spill in the comments below!